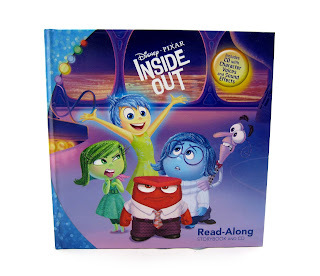 Here we have the Inside Out Read Along storybook...with CD! This book is fun for young kids to read and listen to. The CD (which run 14 mins, 9 secs long) is narrated by Cindy Robinson and features music (not the actual Michael Giacchino score though), sound effects and even some snippets of original dialogue from the movie! The book itself is written by Suzanne Francis, is 31 pages long and covers (very simply) the story of the film. I'll note that the illustrations in this one are the exact ones used in the Inside Out Big Golden Book; however, the story is worded a little differently. But for the most part, if you have the Big Golden Book, this might be one to pass up (unless you wanted the CD of course). Check out some of the inside below! I got this hardcover edition at the Disney Store (which is currently sold out). However, a paperback edition is still available on Amazon. Be sure to visit the direct link below to purchase is you're interested in adding this one to your collection!